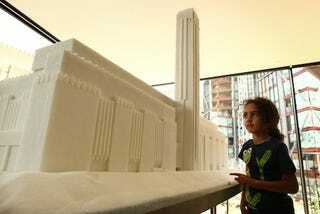 Six year old Max Lord looks at a scale model of the Tate Modern made of sugar cubes at Bankside on June 29, 2010 in London, England. The model was made using 80,000 sugar cubes. The chimney is 1 metre high.